AC/DC YARD VIDEO: AC/DC'S DIABLO, AC/DC'S SALVADOR,AC/DC'S DIABELLA, AC/DC'S MAKUTO, AC/DC'S DRAGOBOY! This crazy junkie and liar Cune continues to correct pedigrees of my dogs. 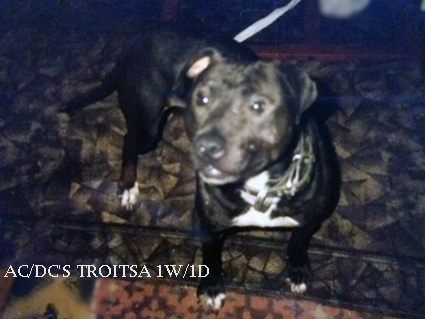 AC/DC'S TROITSA belonged to AC/DC KENNELS. I'm (AC/DC) sent AC/DC'S TROITSA for breeding to Volchiha's Santiago. But Volchiha deceived me, he had no my permission but he matched Troitsa against MALE, and told me about it only after the match, after AC/DC'S TROITSA death. AC/DC'S TROITSA NEVER BELONGED TO Volchiha.